Nathan is pleased to announce they have been awarded a contract to conduct an external evaluation of the Standards and Trade Development Facility (STDF), which assists developing countries in implementing international sanitary and phytosanitary (SPS) standards, guidelines and recommendations to gain and maintain market access. STDF is a global partnership and trust fund, established by the United Nations Food and Agriculture Organisation (FAO), the World Organisation for Animal Health (OIE), the World Bank, the World Health Organisation (WHO) and the World Trade Organisation (WTO) in 2004. Members of the Nathan team and STDF Secretariat in front of the Centre William Rappard, WTO Head Quarters on the first day of meetings. The STDF Secretariat is housed and administered by the WTO in Geneva. As a global coordination and knowledge hub, STDF aims to be a catalyst for advancing policy and practice on SPS capacity building globally. The STDF also supports and funds development and implementation of collaborative, cross-cutting, innovative and regional SPS capacity building projects. The evaluation, which is global in scope, will assess the impact and results achieved by the Facility, with a particular focus on the period 2014-2018, identify lessons learned and provide recommendations for STDF members’ consideration when developing a new strategy for the Facility for 2020 and onwards. 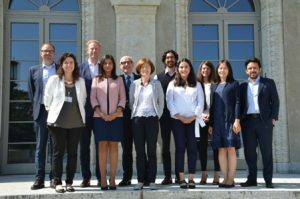 The Nathan evaluation team, led by Nathan’s Head of Trade Eamon Cassidy and Team Leader Mark Hellyer, met in Geneva on Monday 3 September with the STDF Secretariat and senior WTO staff to launch the evaluation, which will conclude in March 2019. To learn more information about Nathan’s work in Trade & Logistics click here.